A nice early example of Dombey and Son,in publisher’s olive green cloth, illustrated with engraved frontispiece, title page vignette, and 37 (of 38) plates by H. K. Browne (pen name, ‘Phiz’). ‘Dombey and Son is both a firm and a family and the ambiguous connection between public and private life lies at the heart of Dickens' novel. Paul Dombey is a man who runs his domestic affairs as he runs his business: calculatingly, callously, coldly and commercially. Magnificent large quarto six volume set of Shakespeare’s plays, with 22 copperplates engraved by James Heath after Thomas Stothard, William Hamilton and Henry Fuseli. James Heath (1757–1834) was the London-born son of a bookbinder. The family originated in Nottingham where James Heath’s grandfather Joseph Heath was a bookseller and writing-master. James was apprenticed to the engraver Joseph Collyer the younger in 1771 and became established as one of the leading line engravers of his time. His first major success was in engraving plates for Bell’s edition of The Poets of Great Britain. He was employed by the Robinson family of booksellers from 1779 to 1804. He became one of the most widely-employed engravers of the age, producing illustrations for many celebrated works including Lavater’s Essays on Physiognomy; Vancouver’s A voyage of discovery to the north Pacific Ocean, and round the world; Bruce’s Travels to Discover the Source of the Nile; and the frontispiece portrait to Boswell’s Life of Johnson. He engraved some plates for Boydell’s Shakespeare Gallery, and in 1807 published this six-volume set of Shakespeare illustrated with engravings after works by Stothard and Henry Fuseli on his own account, a substantial demonstration of his huge popularity. 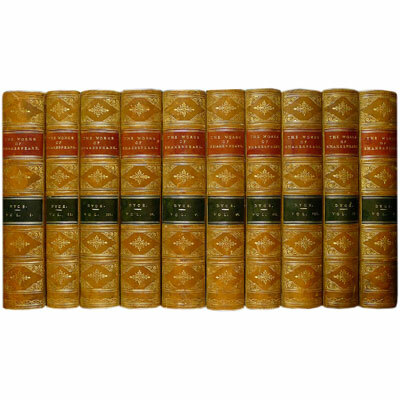 An attractively bound ten volume set of Shakespeare, volume I with Dyce’s Life of Shakespeare, prefaces, and history of the early editions, volume X containing a 526 page glossary.